I had the opportunity to review some PDF sewing patterns for Nicole of Cole's Corner and Creations. I sewed up the Too Cute Tank Dress and matching Dolly Too Cute Tank Dress. 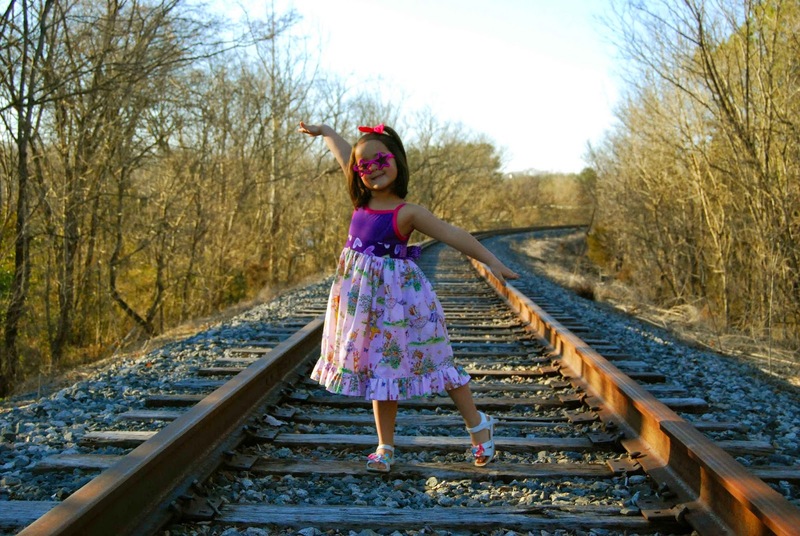 Released last year, the Too Cute Tank Dress is Cole's Corner and Creations first dress pattern. However, she has tons more other patterns (including more dresses!) and each pattern that she releases has a matching Dolly pattern (sold separately)- perfect for matching Dolly and Me sets! 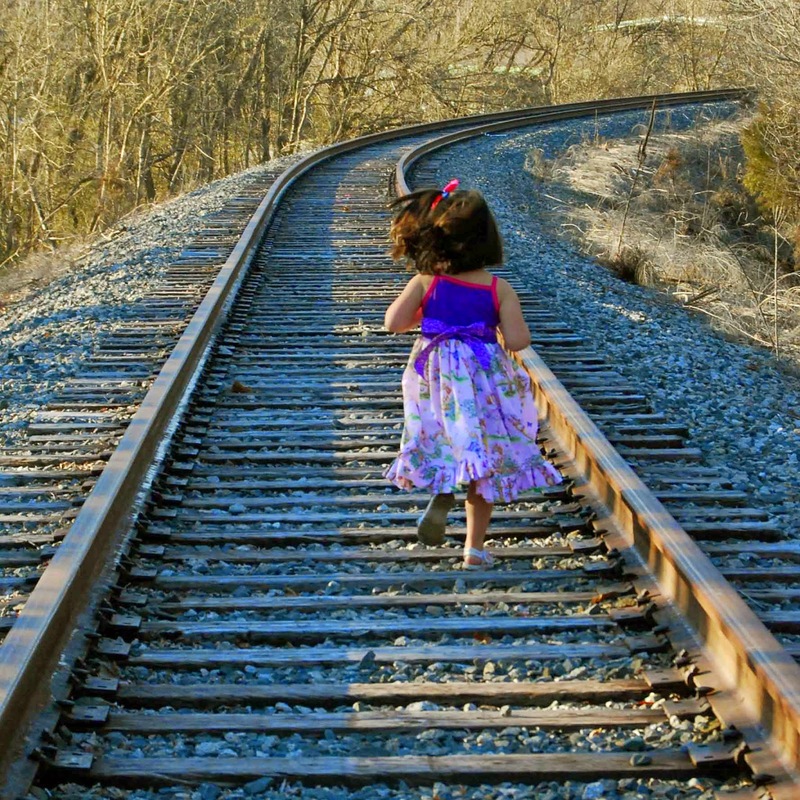 -The Too Cute Tank Dress is written for sizes 1-10. -The Too Cute Tank Dress features a comfy knit bodice and cotton woven skirt. -As the name suggests, this is a tank dress- meant for warmer weather. -The neckline of the Too Cute Tank Dress is mix and match- curved or straight. 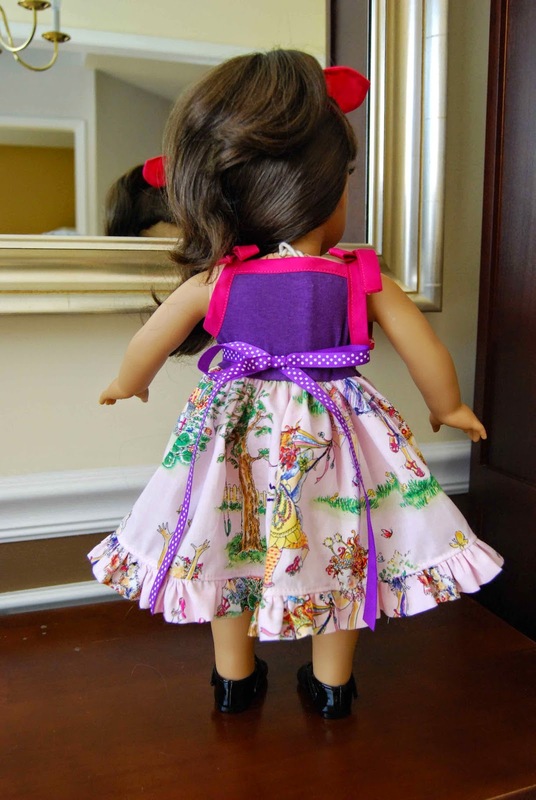 -There are several arm options on the Too Cute Tank Dress- bias binding, FOE, Tie top Straps. -The hemline of the Too Cute Tank Dress can be finished with a patchwork band, solid band or ruffle. Directions are included in the tutorial for the before-mentions hemline options. 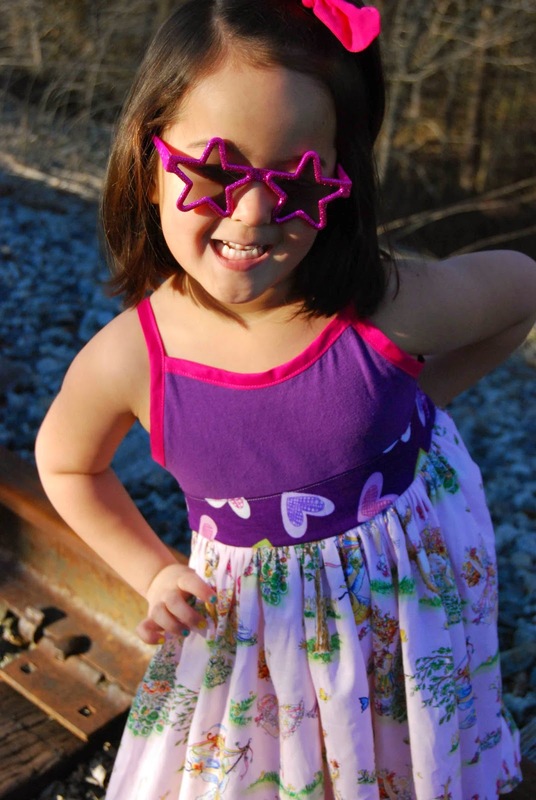 -There are just two pages of pattern pieces to print for the Too Cute Tank Dress. The rest of the pieces are given in a chart of measurements. I chose to sew up a size five, curved front neckline, regular, store-bought bias binding and ruffle hemline (Fancy Nancy would DEFINITELY go for the ruffle!!). 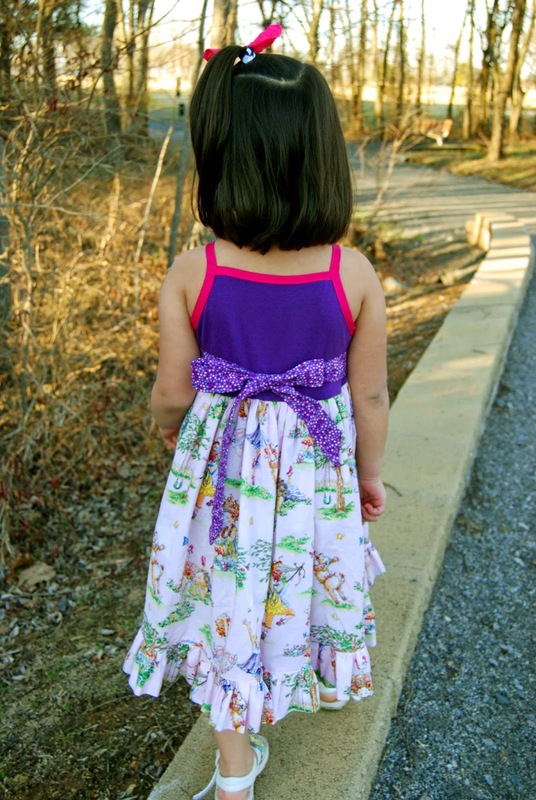 This pattern is great for using up scraps! I was able to piece together the whole dress (plus, the Dolly!) just using what I had in my stash. I had a bunch of Lil' Miss' favorite Fancy Nancy cotton woven for the skirt and I pieced together other, coordinating scraps for the sash and ties. Since this is a tank style dress, the bodice does not require too much knit- another great use of knit scraps!! Win! I believe that this would a be a SUPER great pattern for somebody wanting to first venture into sewing with knit fabric. Because there is so little knit fabric used (just the bodice), the Too Cute Tank Dress would be a great introduction to the world of knits (and end up with a really great end-product!)!! Because I used store-bought bias binding, my prep time was a breeze! Just two pattern pieces to trace and cut out (I did a straight back and curved front neckline). I LOVE a good pattern that only has a couple of pattern pieces to cut out- less ink, less cutting and less taping/putting together. Yay! By going down the list of measurements in the chart, I just checked them each off while I cut out the sash, ties, skirt and ruffle hem. I'll admit, knits are not my most favorite thing to sew with. However, Too Cute Tank Dress sews up quickly and simply. The directions are clear and to the point. Using the bias binding helps speed up the sewing process because hemming and finishing the edges of the bodice are all done in one step! There are lots of little tips and tricks put into the tutorial to help a sewer out. Even if you are a seasoned pro, it's always nice to have a well-written pattern, such as the Too Cute Tank Dress, to guide you. A short glossary of terms, a sizing chart and a fabric requirement chart are all included in the beginning of the tutorial. 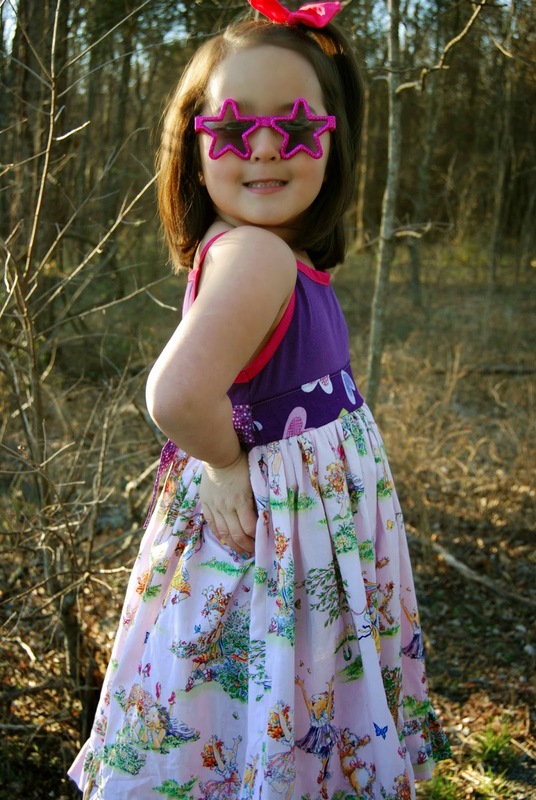 There really isn't anything bad to say about the Too Cute Tank Dress pattern/tutorial. It's comfy and cute and Lil' Miss found it perfect for running around in and playing in. Filled with options (listed above), this pattern will be- dare I say it- "too cute" for warm, summer months! Thank you, Nicole, for a great, quick sew! Love it! 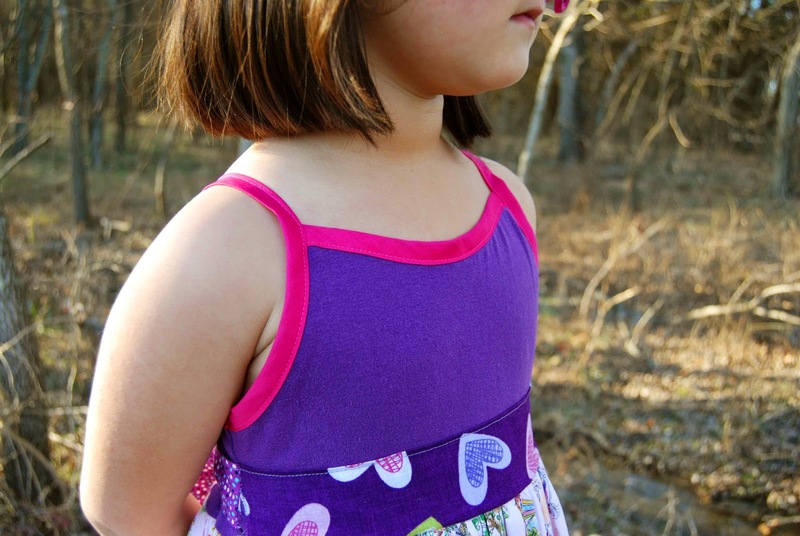 Too Cute Tank Dress- The perfect play dress to run, jump and PLAY in! 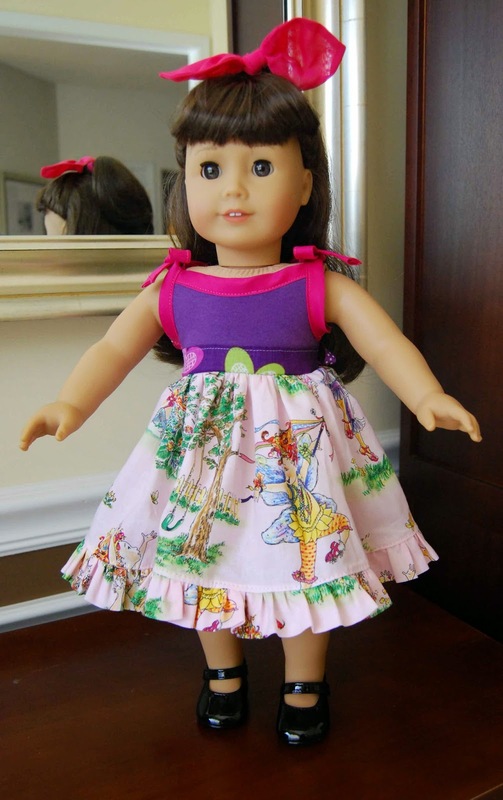 **I also had the chance to sew up a matching Dolly Too Cute Tank Dress for Samantha. The directions for the Dolly are pretty much the same as the girl's pattern. The only difference is that the Dolly pattern only calls for the use of FOE (fold over elastic) for the arm/should straps. Since I didn't have any matching FOE, I just used scraps of the matching, leftover bias binding I used for Katy's dress to create tie shoulder straps. 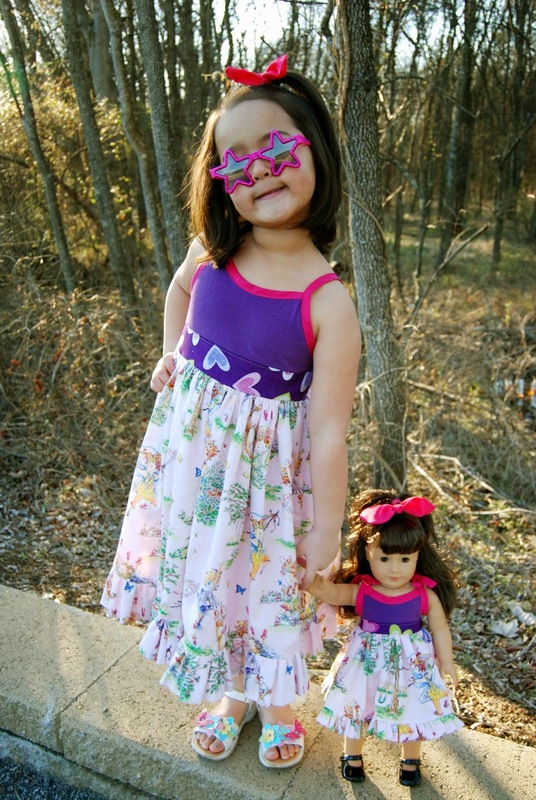 From the look on Lil' Miss' face, I'd say the matching Dolly Too Cute Tank Dress was a success! Oh! Her matching dolly and me set is SO darling! 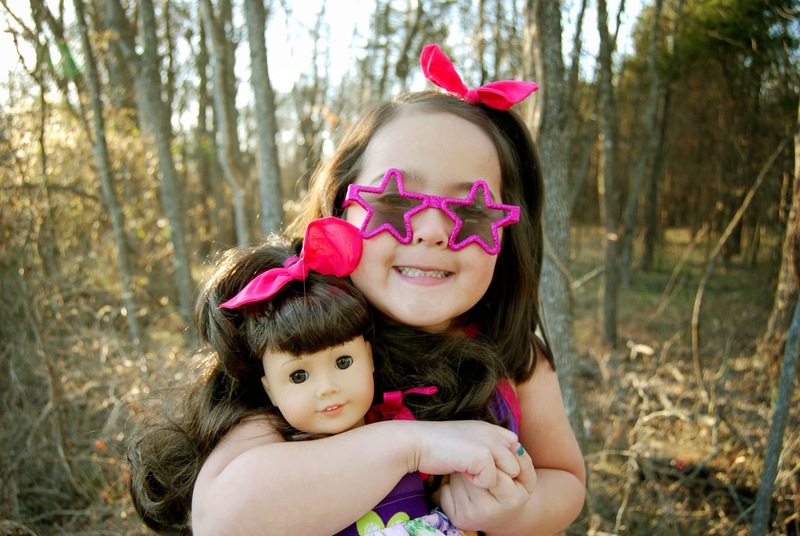 I just love Fancy Nancy and her little poses in her glasses make me smile. I'm so happy you enjoyed sewing up the pattern. Thank you so much!